This is plate 6 from 'The Ruins of Mandoo, the Ancient Mahommedan Capital of Malwah, in Central India' by Captain Claudius Harris. 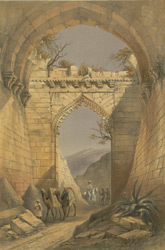 The Delhi Gate was the large fortified main entrance to the walled citadel of Mandu. It bears this name as it used to be the main gateway from Mandu towards Delhi to the north. The vaulted passage has collapsed and there are remains of the wall on either side of the path.